Good food, ambience and customer service are three major aspects that draw customers to place. Dancing Cup also lets you bask in the inviting tranquillity of mother nature, within the Kampala urban. Coffee is one of their signature charms but that is in addition to meals that evoke craftsmanship because its proprietor, Jonathon Wardley, is one who thinks that recipes are not cast in stone. They create and play around with ingredients to deliver culinary adventure at a standard you will find in a three to five-star facility yet at a lower, ‘friendlier’ price. After owning and operating restaurants in England, Wardley moved to Uganda in 2011 seeking new challenges and inspiration in a country he has been associated with since 1996. Initially, he took a position as operations manager for a chain of bespoke safari lodges, before partnering with some of his like-minded friends to create a restaurant concept. Their idea was to start a place that offered not only fresh, imaginative cooking but was genuinely a place where everybody, including children, would feel welcomed and catered for in a home-from-home environment. Dancing Cup, located on plot 15, Luthuli Avenue, in Bugolobi, a Kampala suburb, was first recommended by a friend, Charlotte Beauvoisin, who runs a travel blog. I went there specifically for the burgers. Tasty! The portions, to be eaten in phases. 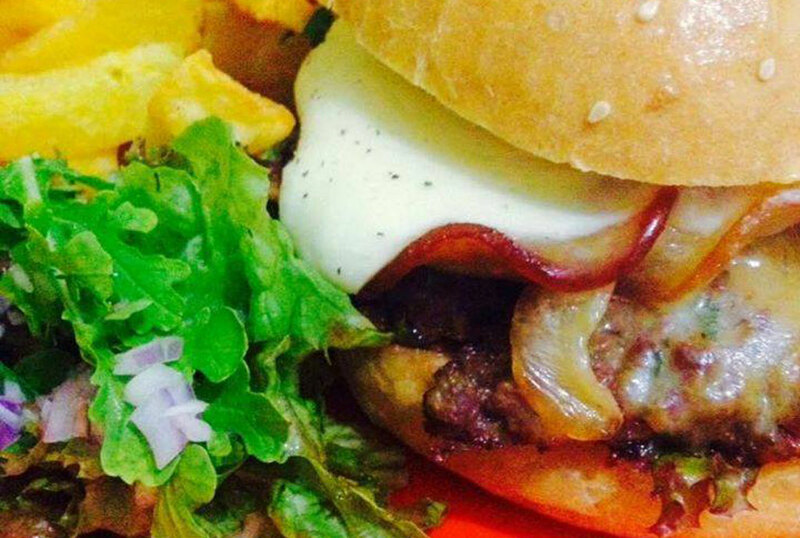 “Our burgers are often lauded as the greatest in Uganda,” Jonathon explains. The menu is as diverse as it is intriguing, catering for all tastes. Dancing Cup, whose name sounds fun, conveys creativity of the arts with the simplicity of a coffee cup. You will be drawn to the hangout’s range of events and activities tied in theme nights. Take your little one (s) for ‘Baby song and dance classes’ on Tuesdays. If not, there is storytelling for toddlers on Friday morning. Wednesday is their biggest night. There is live, acoustic music and it is also a night to wind down. Scottish dancing classes are on every Thursday night with the Caledonian society, Uganda’s oldest society. Tease your brain during the quiz nights on Saturdays, in support of the Uganda Conservation Foundation and other organisations. There is a bead and craft workshop on site, which offers jewellery and customers get a chance to learn how to make their own. Wardley is dedicated to creativity in all its forms as reflected in aspects such as crafting unique flavours in the kitchen, writing articles, supporting musicians, performers and conservation issues. “We have a loyal and large Ugandan customer base which is often tempted to try new dishes. We also appeal to those in the expatriate community who prefer a diverse environment that has a strong local feel, while offering dishes that are creative and to an international standard,” Wardley explains. Not to lose the reason that should give you reason to try the cup, my three recommendations are the well-marinated pork ribs which are served with a choice of rice or Irish potatoes in form of chips or mash, the coffee and family outing with the little ones who have a small play area. If you are out to enjoy a meal as you work or meet someone, there is piped music to complement the thought process and a shelf with an assortment of books in different languages.